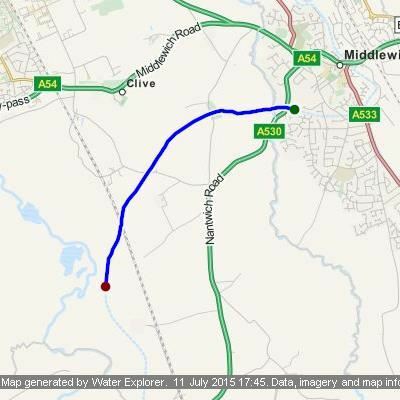 Yesterday we set off for Middlewich to get our signed certificate of sea worthiness for our trip to the river Weaver. The morning started grey but the day soon warmed up as the sun made an appearance. Tilstone lock was the first lock not in our favour, Its quite pretty here so we did not mind the wait. Kevin and I put the world to rights while we waited happily in the sunshine. Chris and Maria happy to work the lock and chat as lady lockys do. We turned left at Barbridge and carried on for a while. 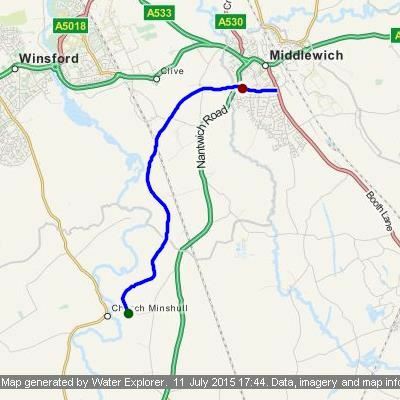 It was only 2pm so we decided to press on so as to arrive at Middlewich early in the afternoon. We found a lovely spot ear Church Minshull to moor but the dreaded Shroppie shelf meant we could not get into the bank so decided to stop for a brew and soak up some rays instead, then move on. A lovely mooring but the shelf was grinding the baseplate all the time despite tight lines. I worry about the base plate rubbing on the shelf so after an hour or two we moved off and found a lovely mooring a little further on by Eardswick Hall Bridge 22 for the night along side some good armco. This morning I was awake with the bird song at 6am. Quite a chorus was going on just outside AmyJo and I found this little group sitting in a dead tree feet away chattering away. It was lovely to sit with a cup of tea and watch them interact with each other. They must have come from the same clutch I would think, and seem to have just fledged. Our goal for today was to drop down Stanthorpe Lock and then meet up with Brian Taylor for our inspection mid afternoon. It was an easy run to the lock in just over 2 hours and then a short wait while 2 boats locked down and 2 came up. And leaves via the bottom. At Middlewich, Wardle lock was as busy as ever. There was barely room to moor after the last bridge so as one boat entered the lock another took its place to wait. We were last in line and that pleased us as we wanted to wind in the junction and retrace our steps if possible as we arrived earlier than planned. Our meeting with Brian was for mid afternoon but we had past our meeting place so winding was necessary. Once down the lock I swung AmyJo to the right ready to carry onto the next available winding hole, however, as no boats were on the move I elected to reverse AmyJo back onto the moorings on the Liverpool side of the junction to wait my turn to go back up instead. Our walkie talkies paid for themselves at this point. I was able to let Chris know the way was clear for the boat coming down the lock to enter the junction which she relayed to the crew and her to let me know when safe to turn in for the lock. All went like clockwork and the crew thanked us with relief as they turned out of the junction. Once out of the lock and heading back I called Brian on the mobile to let him know we were on our way. By now it was quite noticeable that the levels were well down due to all the boats locking down and a passing bottom gate. One lady who had her boat moored at the bottom of her garden asked us about the levels and we told her about the gate leaking and sticky paddle. Brian lives on the canal side with a lovely mooring at the bottom of his garden that is big enough to take AmyJo. Whilst trying to moor up we ran aground with the stern four feet from the bank and could not get in any closer as hard as we tried due to the low level in the pound. Luckily this still left plenty of room for boats to pass so we made do. Brian's inspection was surprisingly brief and painless. All he was concerned with was that we had an anchor (on the roof), fire extinguishers and a fire blanket. All our planning to ensure everything needed was aboard paid off and he happily accepted that our anchor warp and mooring lines were in the bow locker without seeing them. 15 minutes later he handed us our sea worthiness certificate as I handed him a cup of tea in return (plus his fee of £40 pound). Now we have all we need to get on the shipping canal once I send them the forms so the way is clear for our August trip. I've added another page to the blog where I will put all the useful information and experiences as we get them for others in future. Brian's mooring as we leave. The boat in view was aground at the bow and having trouble getting in. On the way into Middlewich this morning we spotted some great moorings by bridge 22 with some super views of the river Weaver and the top flash. We said our thanks to Brian and pulled off his mooring heading out of Middlewich the way we came intending to moor in our chosen spot. Luck was on our side and we took the last spot and moored up for the night. Our mooring for the night, busy but friendly and peaceful. Butty Ilford and tow pass by just as the forecast rain started.. Seems we moored up just at the right time as not long after Ilford and her tow passed us the heavens opened and it started to rain. 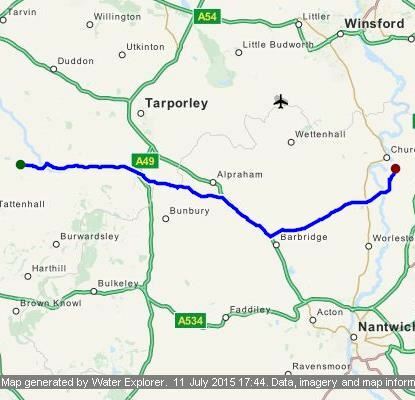 Tomorrow with a day in hand we'll decide where we will head before returning to Tattenhall.